Ceiling fan installations are a great way to reduce your energy consumption and keep your home cool, resulting in significant savings on energy expenditures. While running your home's air conditioning system can cost several dollars per day, each ceiling fan costs pennies a day to operate. Ceiling fans don't just keep your home cool, though. Ceiling fans are also capable of keeping your home warm when temperatures drop during the winter. Since warm air rises, ceiling fans can push this warm air down the walls of a room and into your living space, reducing the costs associated with running your heating system. To maximize the costs savings and efficiency of ceiling fan installations, it's important that careful consideration be paid to ceiling fan installation location, as well as making certain that your fans are running on circuits capable of handling the load. To learn more about choosing the right ceiling fan as well as ceiling fan installation considerations, check out our article, here. 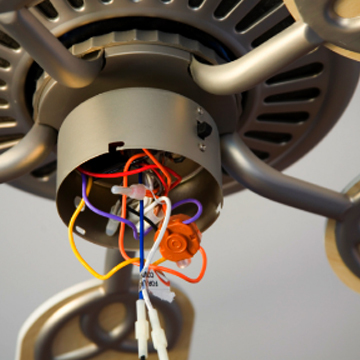 At Spectrum Electric, we've handled hundreds of ceiling fan installations over the years, and we have the expertise necessary to make sure your ceiling fans are working for you. Our expert installation service guarantees that the ceiling fans and all controls are working perfectly, that any circuit breakers are properly labeled, and that the circuit is functioning properly and is capably handling its load. Best of all, our ceiling fan installation services are always competitively priced and there are never any hidden charges.